The Fish River is situated in the upper most region of the Central West catchment of New South Wales. The Fish River together with the Campbells River are the two rivers that converge to form the beginnings of the Macquarie River just south of Bathurst. The Fish River begins South East of Black Springs NSW in the Vulcan State Forest at close to 1200 metres above sea level. Flowing in a northerly direction into Oberon Dam at Oberon NSW it then continues until the Fish River joins the Campbells River, a total distance of 130 kilometres with a catchment area of 129,000 hectares. The Central West CMA Catchment Action Plan (2011-2021) identified the Fish River as a Very High Risk catchment. Such rivers have issues such as a loss of instream habitat diversity, a loss of riparian vegetation and poor bank and bed stability. 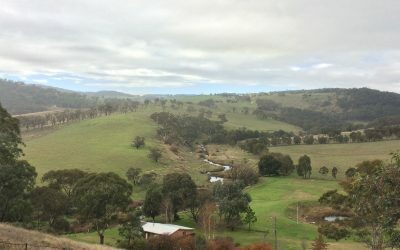 The Central Tablelands Local Land Services applied for funding under the Australian Government’s Clean Energy Futures Biodiversity Fund to target the Fish River catchment and prevent it from shifting to a less functional or less desirable state. The Fish River catchment generally has good geomorphic and hydrological condition and the potential for restoration, which was a priority for the Central West CMA’s biodiversity Catchment targets. The upper reaches of the Fish River contain good aquatic habitat with a diverse range of habitat types. There is a good degree of existing vegetation cover, and the area possesses stable soil characteristics. A number of large areas of remnant vegetation within State Forests and Nature Reserves occur within the Fish River catchment. These remnants provide essential habitat for a number of native fauna and flora species, including the endangered Purple Copper Butterfly, which only occur in this area of the Central Tablelands NSW. In areas where there is low condition habitat, the Fish River had potential for improvement, and these areas were a priority for sediment and nutrient control projects within the Fish River project. Erodible areas that supply sediment and nutrient to the lower end of the Fish River were identified. Protection of identified swampy meadows and significant wetlands in the upland reaches of the Fish River. Restoration of important key faunal habitats. Improvement of aquatic biodiversity, ecological function and landscape resilience within the Fish River catchment and key tributaries. Enhancement and protection of priority riparian and remnant vegetation within the Fish River catchment. A reduction in the impact of invasive weeds through limiting the spread and impact of specific Willow species (Salix fragilis). Increased education and capacity building of landholders relating to best management practice for riparian areas. Improved landscape connectivity through the creation of wildlife corridors primarily within the riverine environment. 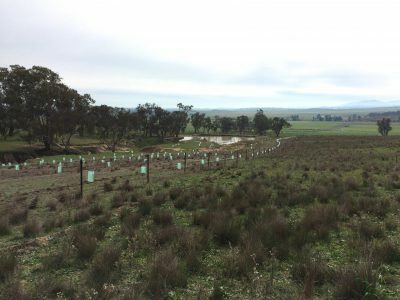 90 hectares of riparian zones enhanced through revegetation of native seedlings. 58 hectares of wildlife revegetation corridors planted and established to enhance connectivity and contribute to improving landscape scale connectivity. 82 hectares of riparian vegetation protected & enhanced through the management of stock access, weed and pest animal control. 75 hectares of terrestrial remnant vegetation protected & enhanced through the management of stock access, weed and pest animal control. 59 kilometres of riparian zones protected & enhanced, including 20.33 kilometres of Willow controlled through removal and restoration activities. 1,092.05 hectares of land managed for the control of invasive plant & pest animal species. 40 Expressions of Interest received. 30 landholder projects funded & completed. Landholders receiving funding under the project were required to complete an accredited whole Farm Plan for their property. Some landholder had already completed an existing Farm Plan; these plans were assessed to ensure they met standards for an accredited Farm Plan. Through completing a Farm Plan landholders were able to gain and improve their knowledge of natural resources, including but not limited to water, soils and biodiversity. Landholders also had to set and prioritise goals and future projects as part of the course, and ensure that these priorities complemented and worked in with their property and enterprise. 6 field day & awareness raising events conducted. These field days increased the awareness and knowledge of participants on a range of topics including, riparian management practices, revegetation restoration techniques, swampy meadows, establishing revegetation corridors, and best practices for effective weed management and pest animal control. 178 participants, including landholders, attended the field day & awareness raising events. 68,877 kilometres of stock proof fencing established to protect riparian, revegetation and remnant areas by controlling stock access. 31 alternative stock watering points established where stock access to water was lost due to fencing activities. 25,215 native tube stock seedlings planted as part of revegetation activities. The following video shows the involvement of landholders taking part in the Fish River project as custodians of the land.